ISRAEL was the destination for Louis Abrahamson, who celebrated his barmitzvah at the Western Wall last month. Son of Ruth and Ashley Abrahamson, of Alwoodley, Louis is a pupil at Allerton High School. A keen drummer, Louis is a dedicated sportsman, playing football for Leeds Maccabi, tennis and golf. His hobbies also include his computer. Grandparents Elisa Silverton, Martin Abrahamson, Christine and Christopher Thompson together with numerous family and friends travelled from Leeds to attend the simcha. Louis has an older brother, Oliver, 15, who attends the Grammar School at Leeds. DAREDEVIL sports fan Adam Bush was barmitzvah at Beth Hamidrash Hagadol Synagogue on Shabbat. 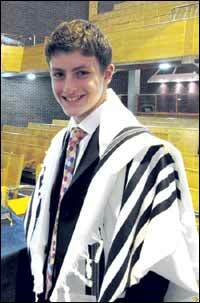 Adam, the son of Helen and Stephen Bush, of Alwoodley, is a pupil at the Grammar School at Leeds. A keen tennis player and golfer, Adam follows Super League champions Leeds Rhinos supporter and loves anything to do with fast cars and aircraft. Indeed, he is set to join the RAF cadets next year. Adam’s grandparents, Jackie and Bryan Bush and Joan and Mike Stevens, together with 10-year-old sister Lana joined guests from Sydney, Toronto and all over the UK at the simcha.